MORGANTOWN, W. Va. (August 27, 2014) – MX Sports Pro Racing is pleased to announce that through an online raffling initiative, the Lucas Oil Pro Motocross Championship, sanctioned by AMA Pro Racing, was able to raise over $30,000 to benefit the Asterisk Mobile Medical Center, an emergency care facility available at each Lucas Oil Pro Motocross event to staff, participants, and crew at no cost. Team Honda Muscle Milk’s Trey Canard announced the winner during opening ceremonies at the inaugural Indiana National on Saturday, Aug. 16. Congratulations to Matthew Boyer of Bedford, Virginia, the lucky winner of a 2014 Honda CRF450R. The bike resembles the Team Honda Muscle Milk machine ridden by Factory Honda riders Trey Canard and Fredrik Noren in the 2014 Lucas Oil Pro Motocross Championship. The bike includes a Yoshimura TI exhaust system, Team Honda/Muscle Milk graphics kit, Honda motorcycle stand and a full set of Fly Racing gear and helmet. Team Honda Muscle Milk CRF450R. The Asterisk Mobile Medical Center is an emergency care facility available at each Lucas Oil Pro Motocross event to staff, participants, and crew at no cost. The full 53-foot hospital trailer is staffed with qualified and experienced medical personnel and offers specialized equipment for our sport’s unique injuries. The Asterisk Mobile Medical Center is provided to the racing community by Asterisk. Their operating budget is made possible by MX Sports Pro Racing, Road 2 Recovery Foundation, as well as individual riders and private donors. The 2014 Lucas Oil Pro Motocross Championship concluded last Saturday with the Utah National in Tooele, Utah. 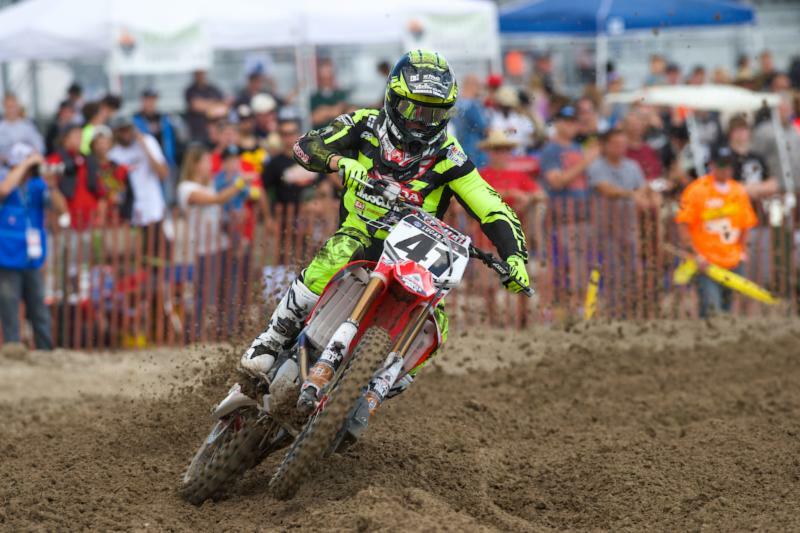 The 2015 Pro Motocross schedule will kick off Saturday, May 16 in Sacramento, California with the Hangtown Motocross Classic. For more information, please visit www.promotocross.com. MORGANTOWN, W. Va. – MX Sports Pro Racing and the Asterisk Mobile Medical Center (AMMC) are pleased to announce the renewal of their long time agreement that will see the AMMC at every 2014 Lucas Oil Pro Motocross Championship, sanctioned by AMA Pro Racing, event. To support this effort, MX Sports Pro Racing has announced a contribution of more than $110,000 to the AMMC for 2014. The Asterisk Mobile Medical Center, and its dedicated staff, has been a mainstay at every Pro Motocross event for more than a decade, in providing on-site emergency medical services to professional motocross riders. The Asterisk Mobile Medical Center is an emergency care facility available at each AMA professional Motocross and Supercross event to staff, participants, and crew at no cost. The full 53-foot hospital trailer is staffed with qualified and experienced medical personnel and offers specialized equipment for our sport’s unique injuries. 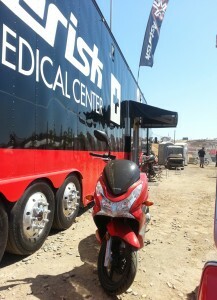 The Asterisk Mobile Medical Center is provided to the racing community by Asterisk. Their operating budget is made possible by Feld Motorsports, MX Sports Pro Racing, AMA Racing, Road 2 Recovery Foundation, Joe Gibbs Racing MX Team, and Pro Circuit, as well as individual riders and private donors. To help support the Asterisk Mobile Medical Center, please visit: www.themedicrig.com. Lake Forest, CA May 22, 2013: The Asterisk Mobile Medical Center would like to thank American Honda for the use of a 2013 Honda PCX 150 Scooter during the 2013 Lucas Oil Motocross Championship Series. This is the second year that Honda has offered our crew trackside and street ready mobility as our rig travels around the country.